Anne-Cécile et Benjamin 7a, arete, sitstart. arete right hand on the boulder in between 6, Salomé and 7, La Roche Volante (marked "N"). Angle d’Attaque 7a+, arete, traverse, slopers. to the right of Cédez le Passage , on the boulder underneath Hale-Bopp . Low start, climb the round arete and exit after a crack before Cédez le Passage . Morceau de Choix 7a, wall, arete. wall with the left arete on the boulder above "La Petite Dame d’Avon", along the blue path. NB : this problem has become much more difficult since holds broke off. Grosse Colère 7a, crack, traverse. start to the right of 5, Le Bel Interlude , traverse to the left with horizontal holds and exit at the second crack. Graine d’Étoiles 7a+, arete, crimps. at the start of the traverse of 29, L’Équerre , on the North face of the crest. Start with the right foot in a small overhang of the arete, take a crimp left hand and exit by the arete. Bisou le Rongeur 6c+, wall, crimps. to the right of 45, L’Exa / Le Pilier de Cabaret, in the corridor, to the opposite of the traverse of Catacombes . NB : upgraded since a crimp partially broke off (November 2012). Roche Bellevue 6c, traverse, slopers. 30m to the right of Grains de Poussière . Start between two boulders and end at the angle. Bossanova 6c, arete, sitstart. right arete, on a boulder exposed to the West, above Le Solitaire , along a small path. Le Mur 6c, traverse. 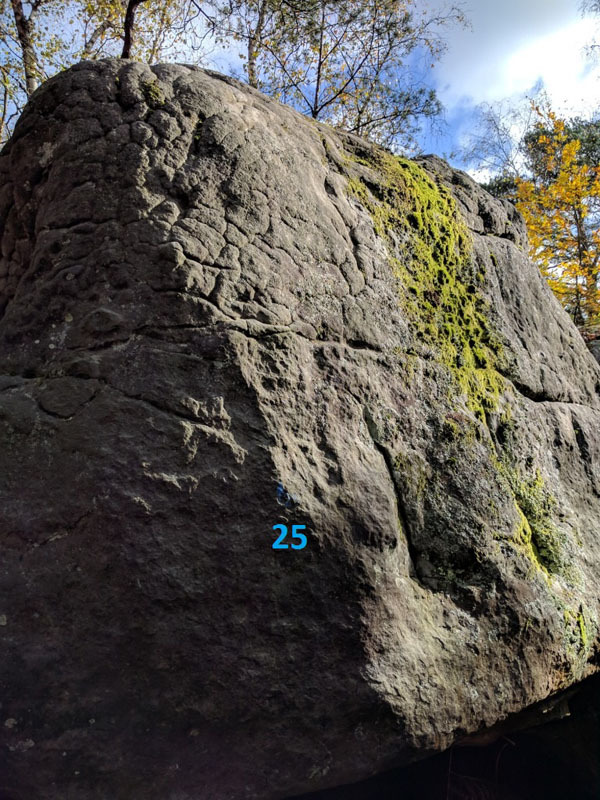 traverse on two faces and exit in 28 (6b by doing only the last face). L’Entonnoir 6c, traverse. above Papier de Verre (see n°11 of the topo Point de Vue). Start before the angle and traverse to the left. Salé-Sucré 6c, traverse. on the boulder to the opposite of Menhir , 50m to the North of album2419.html"> red n°22[.... Traverse to the right and exit in 14, Le Sucre (circuit TD+ n°10 ). Les Feux de la Rampe 6b+, traverse. start completely left, traverse to the right and exit in 7 . L’Ile Mystérieuse 6c, slightly overhanging. to the right of Ramapithèque . Gratte-Papier 6b, wall, crimps. left problem in the crimpsy wall on the boulder above 21, L’Arcsinus and 22, La Grattinée . La Grattinée directe 6b, wall, crimps. direct version of 22, La Grattinée . Chicanes 6b, wall. small wall to the opposite of Beauté Cachée and 5, La Sans les Mains (Face Sud) . Bonne Blague 6a. 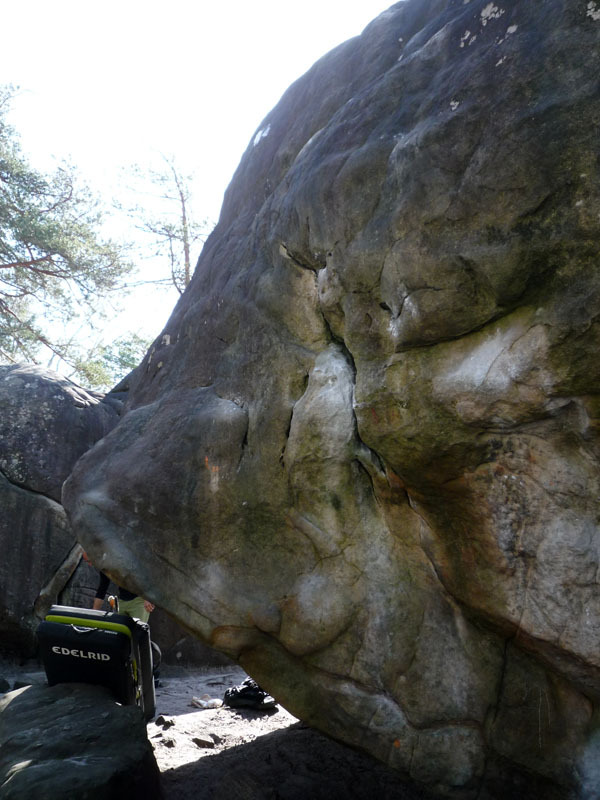 on the second boulder to the North of 62, Le Passe-Plats / L’Ultime Effort (end of the circuit). Vernis à Ongle 6a+, slab, crimps. between 17, La Pierre Vivante and 18, La Patinette . Vague à l’Âme 6a, pillar, sitstart, gaten. sitstart on a big boulder to the left of the path which follows the thalweg from the children circuit of La Feuillardière (access by the Feuillardière parking lot). 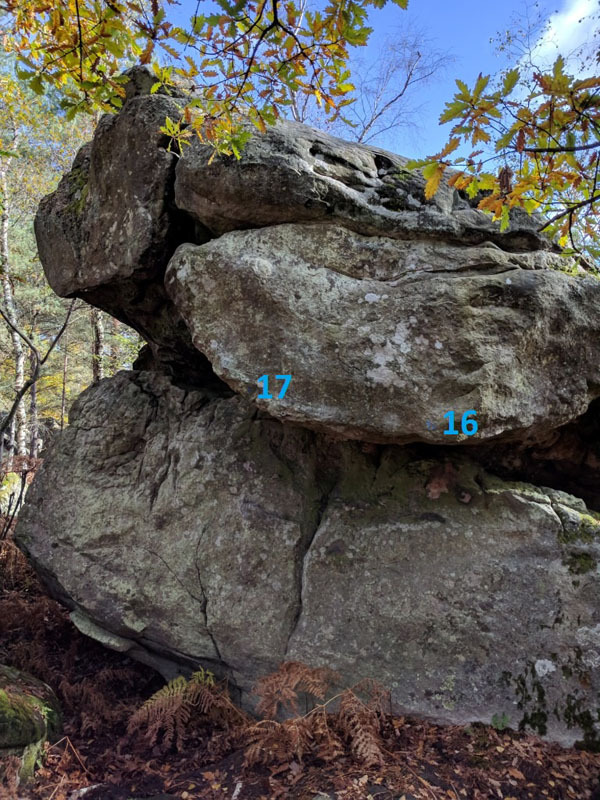 Pachyure 6b, pillar, crimps. to the left of yellow n°13. Piège à Feu 6a+, wall. direct wall to the left of 8 . La Fissure 5+, crack. exit crack of Mayonnaise de Passion (old red triangle). L’Abandonnée 5 , slightly overhanging. in between 11, Bourgeoise and 12, Compagne . Le Raccourci 5 , sitstart. sitstart at the exit of the traverse of 18, Anxiété . Neuf Point Neuf 5-, slab. in between 9, Gouge and 9, Aigreur . Beauté Divine 5+, pillar, high. to the left of 33, Le Périphérique , in a corridor. Le Réta Tranquille 5 , mantle. to the right of black n°10. La Grande Dalle 5 , slab. to the right of 47, Le S (face Nord) (black n°47). Voie Étroite 5 , slab. eliminating slab underneath 1, Le Mirador . Beauté Cachée 5 , pillar. pillar to the right of 5, La Sans les Mains (Face Sud) (black n°5). 9, Court et Intense 5-, wall. on the second boulder to the right of 8, La Danseuse .